Final Fantasy IX owned by Square Enix. - Immediately after exiting Conde Petie you'll wind up on the Conde Petie Mountain Path, and you'll gain a new party member: Eiko. Quina takes off in exchange, though, leaving you with one physical character and three Mages, since Eiko is pretty much Dagger Mark 2, Summons and White Magic and all. Expect some tricky battles for a little while, and lots of healing. Fire is generally good for this area. - Head one screen east after the cut scene. You can climb the vines about halfway down the path on your right and climb up to a treasure chest back on the previous screen. It contains a Tent. There's also a stone monument containing a Red Stone. - Return to the main path and carry on east. You'll see some Oglops skittering about on the ground. If you can manage to grab one you can take it back to Conde Petie. One of the dwarves, Bryan Rootrunner, will give you an Oglop Card in exchange for the Oglop. You'll find Bryan near the entrance of Conde Petie, one screen to the east. 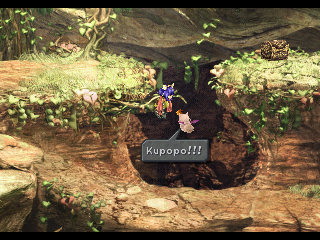 Eventually you'll arrive at a crossroads, where the Moogle Suzuna waits. You should have a letter for Suzuna from Conde Petie. You'll also find Stiltzkin, and this time he'll sell you a Magic Tag, a Tent, and an Ether for 666 gil. Most certainly one of the bigger enemies in the game, Hilgigars is either really hard or really easy. Though it often uses a pair of physical attacks, as well as the occasional Curaga, Hilgigars' primary weapon is Earthquake, which hits everyone in the party for a fair amount of damage. A few of these can demolish your party. Fortunately, you can ignore it altogether by casting Float on your whole team via Dagger. This will negate Earthquake's damage. Cast this every two or three turns and it should catch the next use of Earthquake. For more time, use Slow with Vivi to delay the Hilgigars' attacks. 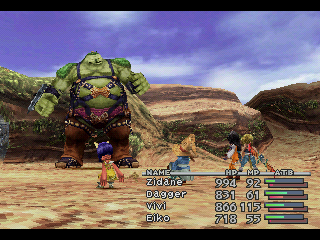 Beyond that, all you need do is smack the giant down with physical attacks and your strongest magic. Zidane can Steal a Phoenix Down, a Mythril Fork, and, very rarely, a Fairy Flute. This last is so rare that I don't recommend bothering with it unless a) You're obsessed or b) You get lucky and snag it within the first seven or eight attempts. - A cut scene follows the battle. Once it's done you'll be at a fork in the path, and you'll be standing in front of a statue with a Yellow Stone set into it. Take the right path, then, on the next screen, the lower, smaller path. It will take you to a small side area with a chest containing an Ether and a statue containing a Green Stone. Take all four of the Stones you've found back to the statue near the Moogles and, once they're in, it will give you a Moonstone. - Take the larger path east. This will take you to the world map.